Published Sep 7, 2017 By Julia 11 CommentsThis post may contain affiliate links. 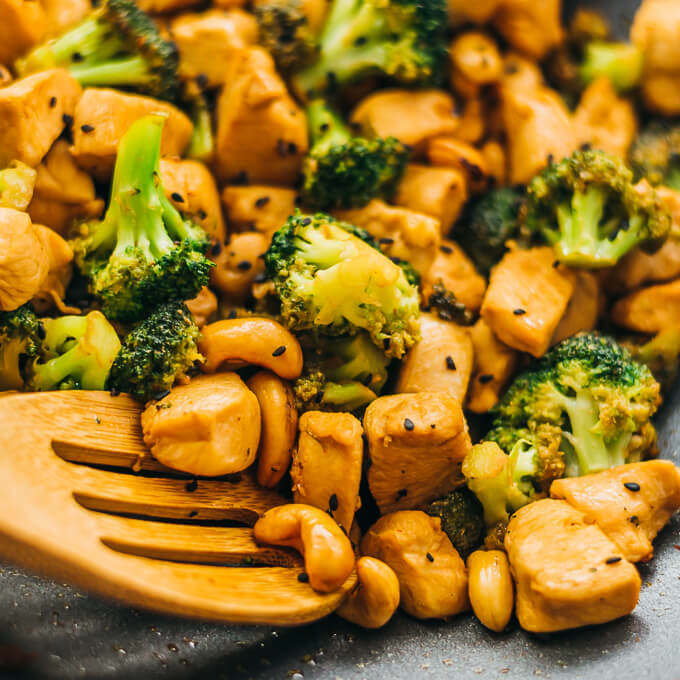 Here’s an easy 30-minute recipe for cashew chicken and broccoli that’s healthy and low in carbs. I love adding nuts to my stir fry dishes for that added crunch — like in this Kung Pao chicken — and this cashew chicken dish is no different. It’s a hearty dish with generous chunks of chicken sauteed with soy sauce, sriracha, garlic, and ginger. The broccoli is cooked until soft and tender, and tastes fabulous with all of the flavors going on. Just before serving, I drizzle a little sesame oil over the dish and scatter some sesame seeds and thinly sliced scallions. Yum. 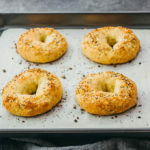 Sesame oil is one of my favorite pantry items because of its unique flavor, and so I often use it in dipping sauces. 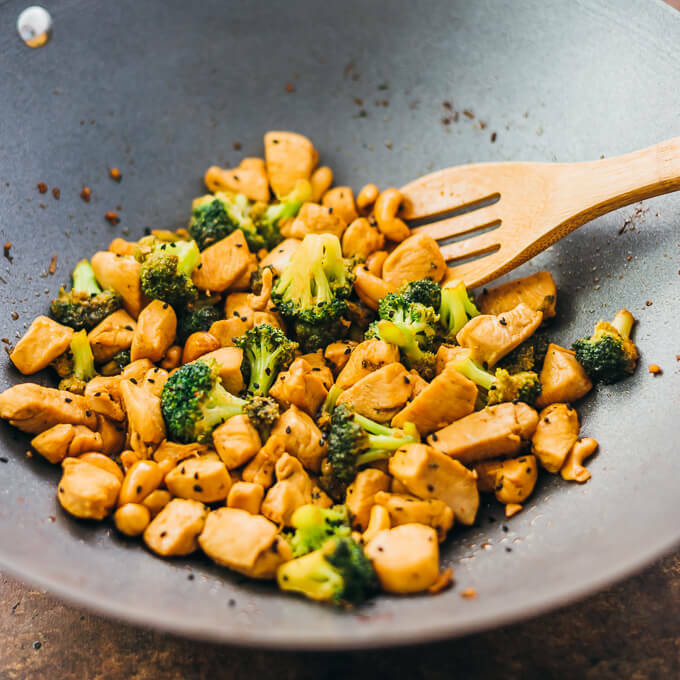 This cashew chicken and broccoli stir fry clocks in at under 16 grams of net carbohydrates, or 8 grams per serving. 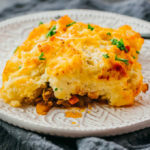 It’s low in carbs and perfect for a keto friendly dinner. Mr. Savory Tooth and I started the keto diet about two weeks ago, as we’re both interested in eating healthier and allowing our bodies to be fat-adapted instead of relying on carbs for energy. I’ve been reading The Obesity Code by Jason Fung in order to learn more about nutrition and how food affects our body. It’s been a huge eye-opener, to say the least, and I feel like my mind is blown after each chapter. It’s crazy how much incorrect information is still being propagated by dietitians and the government itself on what and when we should be eating. Back to this recipe. The broccoli is cooked until very tender, which is how I like mine done. If you prefer yours to be crisper and less tender, you can add the broccoli to the pan about five minutes before the chicken is done cooking. Or, you can cook the broccoli separately to make sure its texture is just how you like it. A quick tip about the chicken: it’s best if you chop it into similarly sized pieces, so that they cook at the same rate, otherwise some smaller chunks may be overcooked. I cut mine into about 1/2 – 3/4 inch chunks, which are nicely bite-sized. If you love Asian chicken skillet dishes, try out my best chicken tikka masala recipe for some delicious homemade Indian food. 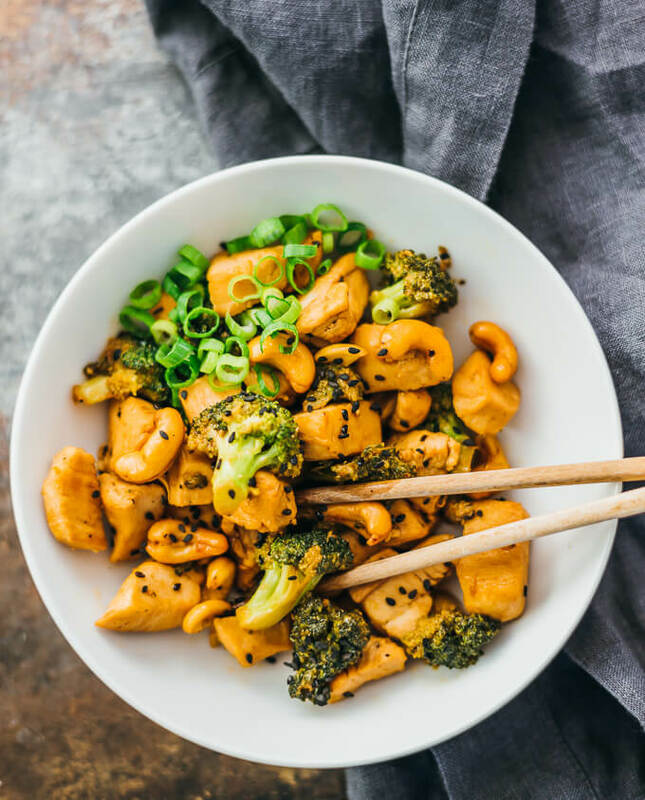 This is an easy 30-minute recipe for cashew chicken and broccoli that’s healthy and low in carbs. Combine sauce ingredients in a small bowl and stir to mix well. Set aside. Heat canola oil in a wok or pan over medium-high heat for a few minutes or until hot. Add chicken chunks and broccoli. Cook until the chicken is cooked through and the broccoli is tender, 5 to 10 minutes, stirring frequently. Decrease heat to medium-low. Evenly pour sauce over the chicken and broccoli, immediately stirring until well-coated with the sauce. Stir in cashews. Cook for another few minutes to thicken the sauce a bit, stirring occasionally. Turn off the heat. Top with sesame seeds, scallions, and sesame oil. Serve immediately. 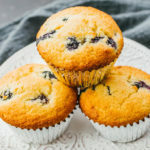 This recipe yields 11.5 g net carbs per serving. This was a quick and healthy dinner! My husband HATES broccoli but there were zero leftovers. I definitely liked the added flavor of the sesame oil-will look for more recipes that include that. Thank you for a great meal! Looks delicious, but I have a question. I have been told that Canola Oil is not good for us, so I stay away from it entirely. Have you researched that? I have! From what I’ve researched, canola oil is a safe and healthy fat — check out this explanation by a Harvard nutrition professor and this answer from a Mayo Clinic dietitian. Added some peppers for color and it was great! Hey Julia! 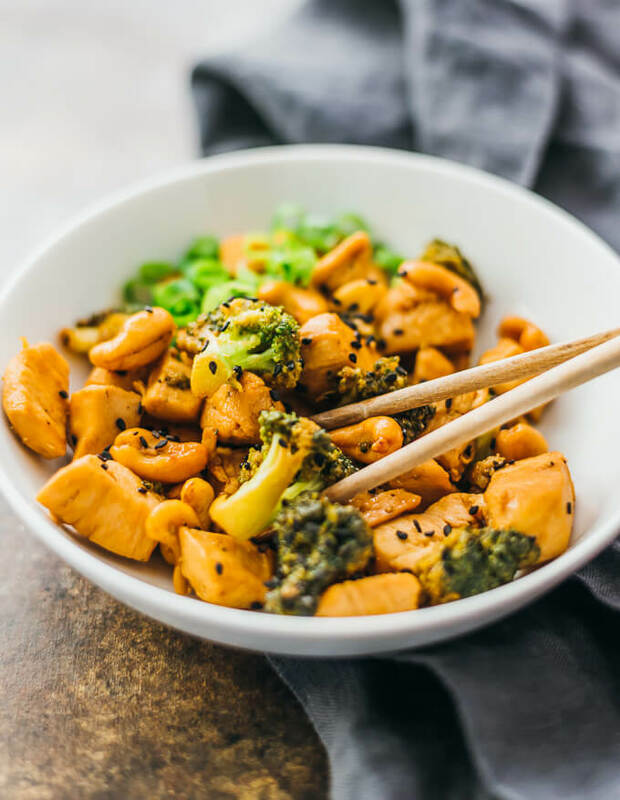 This cashew chicken and broccoli stir-fry is so tasty and easy to make! I’ve made it a couple of times and both my partner and I love it. Question: What would you suggest as a substitute if I’ve ran out of sriracha? Thanks! I’m glad to hear you guys loved it! If you run out of sriracha, I would suggest substituting with any kind of sweet garlic chili paste. 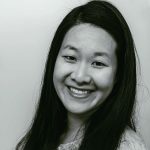 The taste won’t be exactly the same because hot sauces differ in the amount of sweetness, spices, and vinegar used but hopefully it should come close. This looks yummy but Sriracha has sugar, so while it’s low-carb, it’s not really keto. I may try this with sambal oelek (from the same brand as Sriracha, chili garlic sauce just without the sugar). Best if luck in your keto journey! It’s SO worth it!